Two of the 4,700 new emergency dispatch radios purchased for police, fire and EMS departments in Montgomery County on display in Norristown, Wednesday, Aug. 24, 2016. The condition of the radios used by police in Norristown became downright "irresponsible" in recent years, according to Chief Mark Talbot. Some officers held their all-valuable communications device together with rubber bands as many of the department's radios were bought back in the late 1990s. That changed this week when the borough became the first in Montgomery County to receive a new batch of the expensive equipment. One radio costs $3,600. The 75 handheld radios and 14 mobile devices for Norristown are the first of 4,700 that will eventually be given out to every police, fire and EMS department in Pennsylvania's third-most populous county. They are an integral part of a $36 million overhaul to the county emergency radio dispatch system. Thirty new or improved antennas are also being erected at locations spread out across Montgomery County to improve coverage for first responders. "It is irresponsible if you use technology that out of date," Talbot said at a news conference unveiling the new radios Wednesday. "We are in a much better place right now." The next police departments to receive the new Motorola radios are Cheltenham and Montgomery Township, officials said. 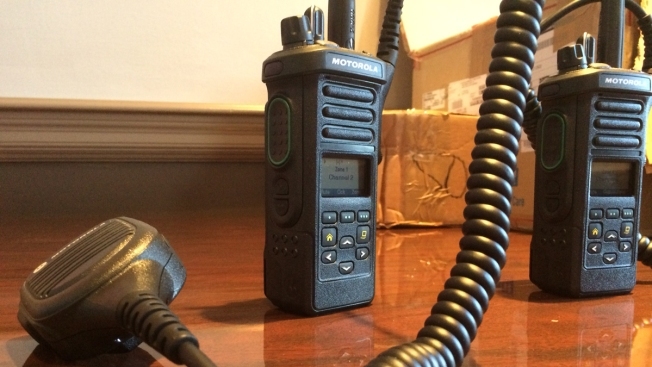 All of Montgomery County's police departments will have new radios by the end of September. All fire and EMS departments will have new radios by October. To listen to Plymouth Township police Chief Joe Lawrence tell it, a well-functioning radio is the most crucial piece of equipment to a cop. "If I had to put one gun or one radio in an officer's hand, I'd put a radio," said Lawrence, who is chairman of the county Police Chiefs Association. "That's how important communication is." The county secured funding of more than $6 million for all of the new radios through the Delaware Vallery Regional Finance Agency, and is not charging municipalities the interest that comes with the financing. In Norristown, the radios cost $326,000. County Commissioner Josh Shapiro said the radios are the first tangible pieces of the dispatch system overhaul that began in 2012. "It was failing, and it had been failing for more than a decade," he said, adding that dead spots in radio coverage have also been addressed. Twenty-nine of 30 new giant antennas have been erected or are currently in construction. The lone remaining antenna to be built is being held up by Upper Merion elected officials, the county said. Upper Merion has disputed the county's portrayal of what has become a public battle of the antenna's construction at a state police-owned parcel along Hughes Road. The county commissioners sent a letter to Upper Merion's board of supervisors Wednesday afternoon asking "for quick action related to a matter of Public Safety that impacts residents of Upper Merion as well as residents of neighboring communities." We are writing to ask for quick action related to a matter of Public Safety that impacts residents of Upper Merion as well as residents of neighboring communities. As you know, we have been working successfully with municipalities across the County to upgrade and improve radio service for first-responders. Montgomery County began its $36.4 million radio upgrade project more than four years ago, with input from police, fire and EMS units countywide, including Upper Merion. The system that these first responders helped craft is designed to improve communication, and in turn, the safety of the men and women who protect us all. To date, 29 of 30 municipalities have taken action to upgrade their radios, and ensure, through the development of new or improved radio towers, that these radios will receive the signals necessary to serve the community. We’ve worked hard with these municipalities to improve public safety for county residents, law enforcement and first responders and look forward to working with you to accomplish our shared objective. Under your leadership, you have already moved forward with the purchase of $700,000 worth of radios for the Upper Merion township police and $800,000 worth of radios for the township’s volunteer fire and EMS agencies. While this is an important first step, without the radio tower on Hughes Road, there will be numerous dead zones throughout Upper Merion and neighboring communities. Municipalities that will also have diminished coverage are copied on this letter. We estimate that there will be more than 4000 properties without proper radio coverage, including more than 800 in Upper Merion Township. The full value of your investment in radios will be unrealized because so many properties in Upper Merion Township are in areas that will not get a clear signal. Montgomery County staff has tried to work closely with Upper Merion Township officials to ensure radio coverage for police, fire and EMS but we have been unsuccessful. For the last two years we have tried to use existing pathways in zoning and with the Board of Supervisors to get the tower approved. Along the way we have experienced numerous roadblocks to moving the project forward, culminating in your adoption on November 12 of last year of changes to the township’s zoning code, which altered the treatment of radio towers such as ours, changing it from being permissible by special exception to being categorized as a prohibited use of the land. • An amendment to the zoning code changes you adopted in November of last year, adding a conditional use in Section 1.B (§2.1) with the language “except for emergency public safety whereby permitted by conditional use” would quickly remedy the situation, and the exception would be limited strictly to public safety uses. • Alternatively, you could grant the County the same exception you have granted yourself - Tower-based WCFs not located within a right-of-way are permitted by right on all land owned by the Township or a Township authority, regardless of zoning district”. By simply adding the text “land owned by the Commonwealth of Pennsylvania” to the exception Upper Merion carved out for itself, the County could proceed with the zoning approval process. We cannot further delay this important radio upgrade project, as doing so would be to the detriment of the safety of all Montgomery County residents, and at a considerable cost to taxpayers. The County will go through zoning on issues such as tower height and setback from the property line once the public safety exemption is made. As we know, the fundamental purpose of zoning is to protect the health, safety and welfare of the public. We know you believe in and share in this important responsibility.